While it seems Civilisation 6—the next entry in the long-running turn-based 4X series—will come packing a fair number of new features come October 21, the one change that appears to have drawn the most attention so far is its art style. It’s not all been positive, and when PC Gamer caught up with the game’s Senior Producer Dennis Shirk, he said the negative response didn't surprise him. "When you play 500 to a thousand hours of a game like Civ 5, when you do an overhaul like we did, it's going to be startling no matter what because it's a game people really love to play,” he said. “And when they see just plain screenshots without motion, without UI, without everything else that goes into it, without the context of why we did it, I can understand why there's consternation." I think my favourite part of that is how the new leader avatars are shaping up, and I’m looking forward to seeing how their personalities bleed onto the battlefield. Admittedly, I haven’t sunk an inordinate amount of hours into the series’ past outings, so I was pleased to hear Chris fared okay during his 60-turn hands-on, as someone on the same boat. 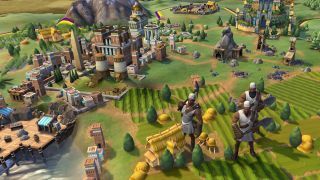 Civilization 6 is due to launch October 21. In the meantime, here’s everything you need to know.